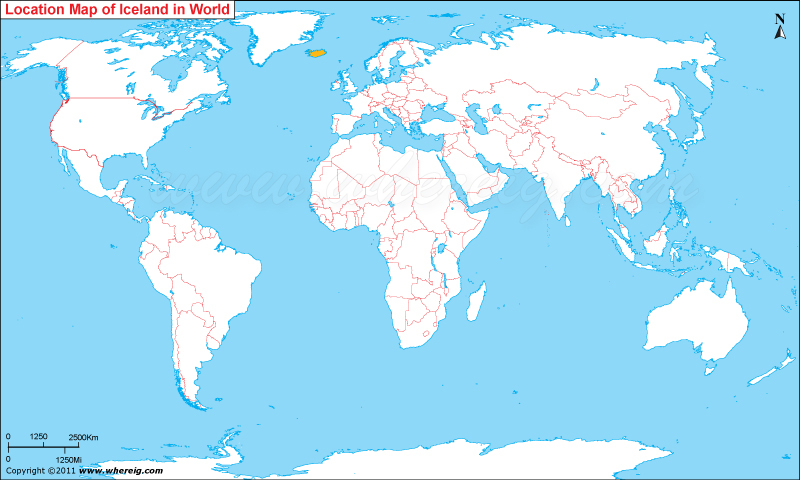 The given location map of Iceland shows that Iceland is located in the far western Europe. Iceland map also shows that the Iceland is an island country situated in the Atlantic Ocean exactly in the middle path of Mid-Atlantic Ridge. This is the reason that the island country is volcanically active zone. However, the interior of the Iceland mostly comprises of a plateau characterized by sand fields, mountains and glaciers. Gulf Stream warms the country's surroundings and hence it has a temperate climate in spite of being nearby Arctic Circle. Reykjavik is the largest and capital city of the country located on the western coast. Not only this, the city and its surrounding area collectively are the home of about two third population of the country. The government type of Iceland is a representative democracy and a parliamentary republic. Probably, Iceland is world's oldest democratic country. The head of state i.e. the president is elected by popular vote for a term of four years. In Iceland, there is no term limit. Interestingly, Iceland has a free market economy along with comparatively low taxes in comparison to other OECD countries. In spite of being very remote island country, Iceland is world's one of the most developed nations and as per 2010 data given by United Nations' Human Development Index, it was ranked 17th most developed country in the world. Not only this, Iceland has world's most free press.